The High Energy Astrophysics Group of the Department of Physics and Mathematical Physics of the University of Adelaide is collaborating with the Institute for Cosmic Ray Research of the University of Tokyo and a number of other Japanese institutions and the Australian National University on the CANGAROO project in the field of high energy astrophysics. The CANGAROO project - standing for the Collaboration between Australia and Nippon for a Gamma Ray Observatory in the Outback - has a gamma ray telescope at a dark site 12 km north of Woomera, a desert town 500 km north of Adelaide (see top map on right). The site of the telescope is latitude 31 south and longitude 136 east. It is at an altitude of 165 metres above sea level. A large 10m telescope, shown in the illustration below the maps, was constructed on site and became operational in March 1999. It has 114 eighty centimetre spherical mirrors arranged on a paraboloidal dish with focal length 8 metres. The old 3.8 metre accurate mirror with 256 tube camera, shown in the illustration in the picture gallery, is now in mothballs. Pictures of the telescopes are in picture gallery. The new telescope, CANGAROO II, is fitted with a 552 pixel photomultiplier tube camera (0.15 degree resolution). The photomultipliers, type R4124UV 13 mm diameter, are sensitive light detectors. The camera tubes are fitted with light guides to enhance efficiency and to provide an energy threshold of about 200 GeV. This will be reduced to about 100 GeV by the joint operation of the four Cangaroo III telescopes. 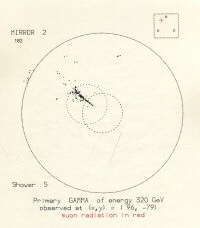 The field of high energy astrophysics studies gamma rays with energies above several hundred GeV. That is, approximately, an order of magnitude higher than the most energetic gamma rays detected by NASA's Compton Gamma Ray Observatory and 100,000 higher than x-radiation used in medicine and dentistry. The flux of these gamma rays is very low, but interesting and useful information has been obtained on galactic objects such as the famous Crab nebula, and southern sources such as the Vela pulsar, PSR1706-44, the historic supernova SN1006 (see recent results) and others. The exciting frontier field is to detect southern extra-galactic sources or blazars. We were part of a world wide multiwavelength study of PKS2005-489. Satellites, ground stations and many investigators in 9 countries are involved. Very high energy gamma ray astronomy uses the Earth's atmosphere as the front end of a detector with a large collecting area that approaches 100,000 square metres. 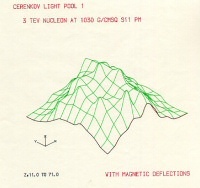 The incident gamma ray initiates (via electron-positron pair production and bremmstrahlung) a cascade of relativistic particles through the atmosphere, with velocities exceeding the local speed of light, which results in the emission of optical Cerenkov light. 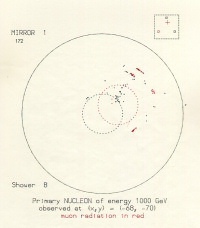 A single photon entering the atmosphere results in a pool of blue light spread over, typically, 150 m at ground level around the direction of the incident gamma ray. Naturally, only clear, moonless nights are suitable for these observations! 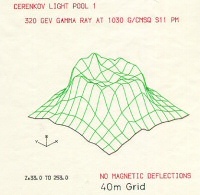 However, the Cerenkov light from very high energy gamma rays must be detected against a much larger background of Cerenkov light produced by cosmic rays entering the Earth's atmosphere. Cosmic rays are charged particles, most commonly protons (hydrogen nuclei). Being electrically charged, the cosmic rays trajectories are deflected during passage through the (weak, but large scale) galactic magnetic field. 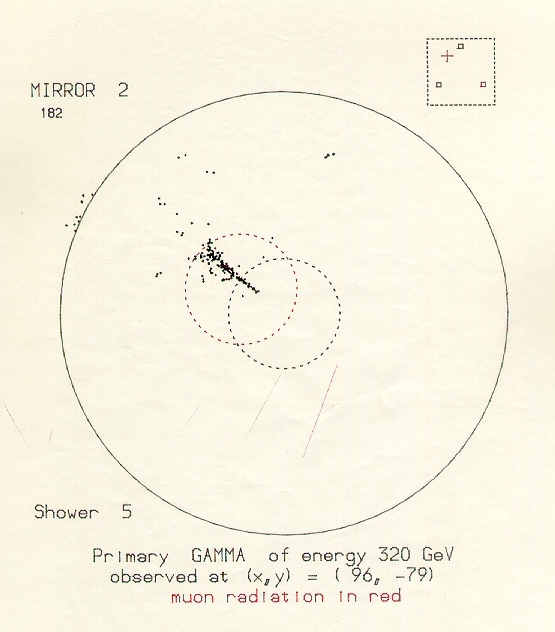 Gamma rays are not deflected during their passage, and so travel in straight lines from their source. 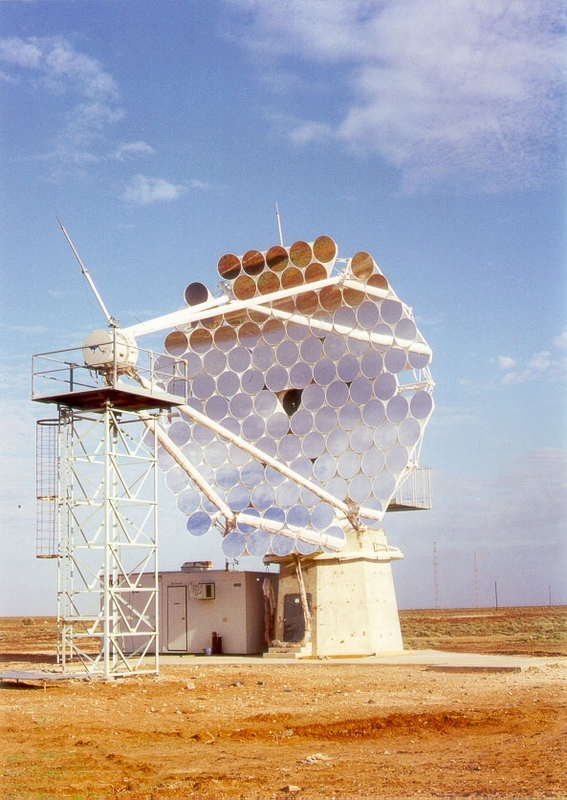 Our CANGAROO telescopes utilise the Cerenkov imaging technique to differentiate between any gamma ray initiated cascades and the cosmic ray background. This technique, pioneered by the Whipple group in Arizona, uses a very fast, multi-pixel photomultiplier detector, or camera, to study the the image of the atmospheric Cerenkov light in the focal plane of the telescope. Both the orientation and shape of the image are used to discriminate against cosmic-ray-like events. A computer later produces a map of the source being investigated. But this is not what is seen by the camera. Instead, the camera sees an image of the column of glowing electrons produced in the Earth's atmosphere. Some examples of computer simulated images are shown to the right. By clicking on them you will see the full image. 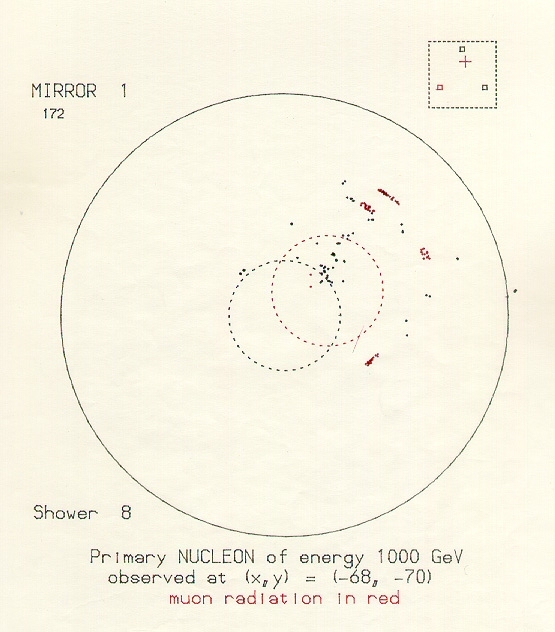 These images showing individual photo-electrons illustrate the way in which the light falls on the telescope and is then detected by an ideal camera. From the intersection of the axes of the fourth image it is possible to then determine the direction of the source. 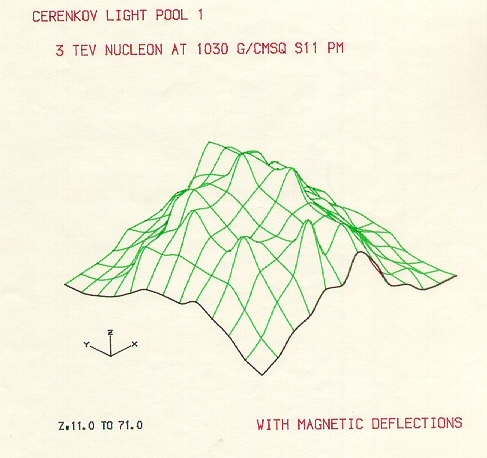 The bottom two diagrams show the light pool on a 40 metre grid pattern on the ground. 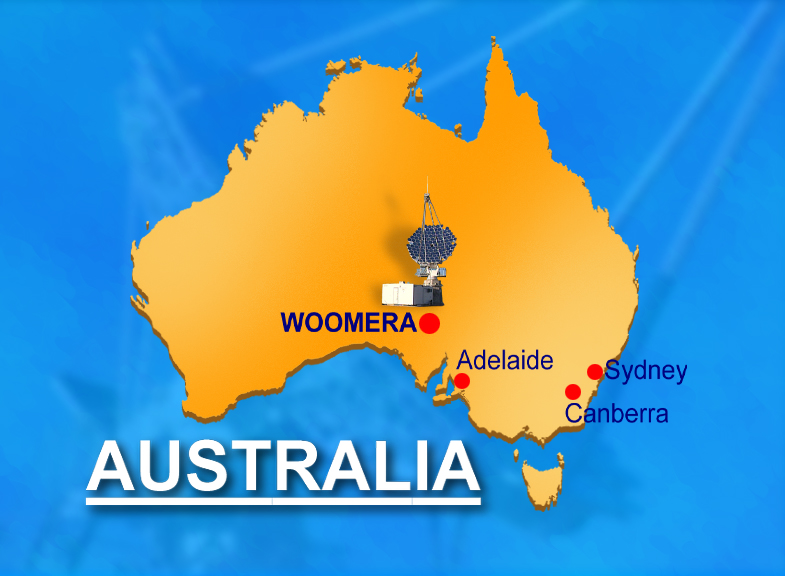 A map of Australia showing the location of the CANGAROO Site at Woomera. Click on the image to see a large version [785x576, 423KB, PNG]. 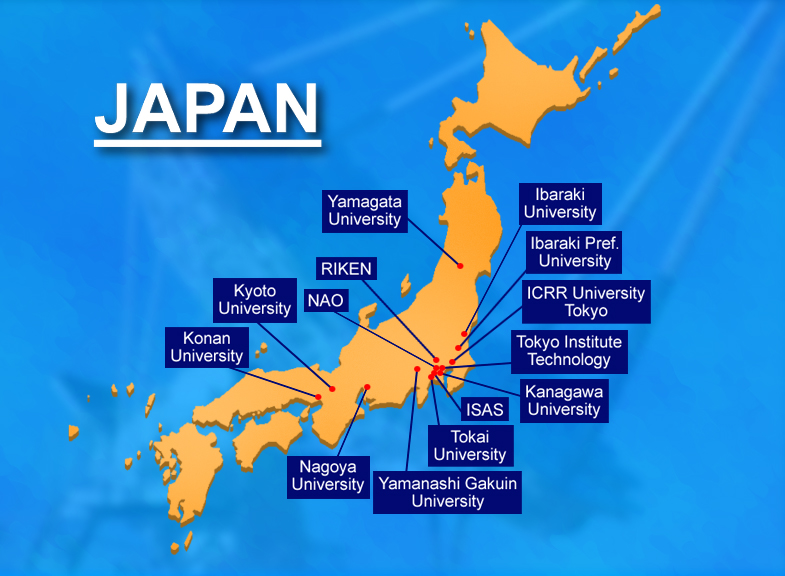 Map of Japan showing the location of participating institutions.. Click on the image to see a large version [768x576, 434KB, PNG]. 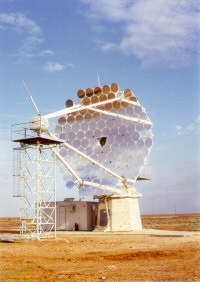 The CANGAROO II 10m Gamma Ray Telescope. Click on the image to see a large version [593x837, 244KB, JPEG]. Computer generated image of Vela. Click on the image to see a large version [732x720, 83KB, GIF]. Click on the image to see a large version [555x632, 141KB, JPEG]. Click on the image to see a large version [555x632, 138KB, JPEG]. Click on the image to see a large version [487x458, 111KB, JPEG]. Click on the image to see a large version [417x406, 100KB, JPEG].